*Saturday delivery is offered at an additional charge for £9.00. However, if it is your first delivery, your order is over £75.00 or you have a Meat Box included in your delivery, Saturday delivery will have the reduced additional charge of £4.00. Due to the nature of the perishables, our couriers must leave your delivery. Please be as detailed as you can the delivery instructions box. Bank holidays may affect your delivery. Unfortunately, we cannot offer Sunday or Monday delivery. AB37-38, IV21-24, IV26-28, IV40, IV52-54, KW5, KW11-14, PA36, PA40, PH31, PH33-41, PA80. Unfortunately we cannot deliver to the Islands. We know that one of the biggest problems with supplying meats via courier is the dreaded polystyrene boxes that the meat is packed in. They are big, ugly and hard to get rid of when used. Not to mention how un-environmentally friendly they are. That’s why we have decided to use a new form of packaging to deliver our goods. 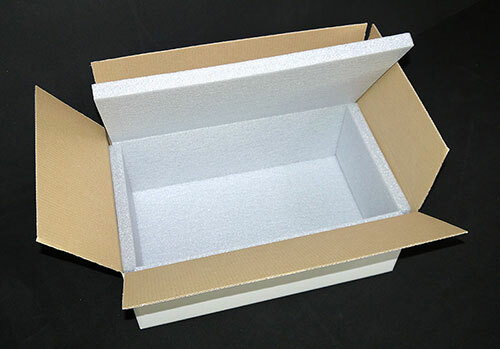 The “Gilmour Hamper Box” is a foam lined corrugated box that can be flat packed before and after use. They are robust, reusable and fully recyclable, unlike the polystyrene boxes. Each product will come individually wrapped. Steaks, poultry and joints are likely to come in vac-packs, whilst burgers and sausages will be protected in tray packaging with a film lid. We do this because we send everything fresh! There will be one or two ice gel packs in your order. These are food safe and re-usable. If you have a problem with your order, please contact us at questions@gilmourbutchers.com or phone us at 01875 613829. We will then organise the replacement, return or refund of your order as appropriate. It may be that we need to see the product, in which case we will email you a parcel collection label and organise a pick up.